I’m pleased to have a post from Kelsey Martin of Modernize today. It was 5 Herbs To Grow In Your Kitchen Garden, but I said, “I have a fantasy trilogy named SAGE,” and she included Sage in the list! How cool is that? Way, that’s how! Growing herbs in your kitchen is easy and convenient. You don’t need a lot of extra space to create an indoor herb garden—in addition to quart-sized pots and your favorite potting soil, a windowsill or about three feet or counter space along the wall will do just the trick. Each gently pointed leaf of the basil plant is packed full of vitamin K, which helps to build strong bones and protects the heart from cardiovascular disease. Basil also happens to have antibacterial properties that fight against internal infection. You can use basil in everything from fresh salads and dressings to soups, casseroles, pastas, and even pizza. Featuring a slightly rough texture, you always know when thyme is nearby thanks to its extremely aromatic fragrance. This hearty little herb packs an impressive punch of vitamin C and makes any dish come to life with a richly exotic flavor. A variety of flavonoids are also found in thyme, which improve its antioxidant capacity and keep blood cells healthy. Thyme goes great with chicken dishes and when used as a garnish for potatoes. Although a native to northern Africa and the Mediterranean, Lavender can be successfully grown indoors almost anywhere. Lavender is known to promote peace of mind by reducing feelings of anxiety, and it minimizes symptoms of insomnia with the help of the flower’s fragrance. Try placing lavender leaves in a reusable spray bottle and mixing them with extra virgin olive oil overnight. This will create a lightly fragranced oil that can be sprayed on the face and body right before bedtime. Believe it or not, mint boasts one of the highest antioxidant properties of any food out there. Enjoying just a few leaves of fresh mint in a smoothie or salad will provide you with handsome doses of both calcium and magnesium. Mint’s also known for calming the stomach to minimize nausea and discomfort due to indigestion. Mint makes an awesome accompaniment to chilled drinks such as tea and lemonade, too! This evergreen herb grows quickly, but a little bit tends to go a long way when it comes to flavoring food. Rosemary has anti-inflammatory compounds that keep bloating to a minimum, and it’s known to help improve blood circulation. 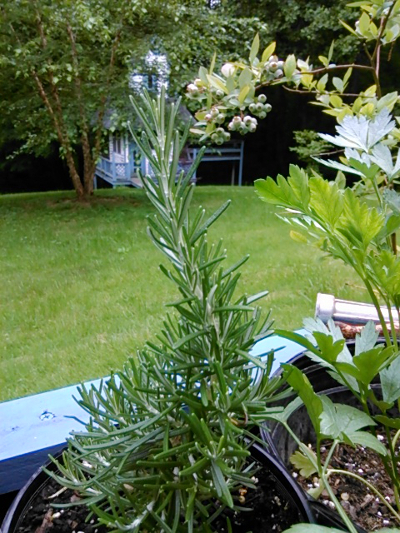 Rosemary even happens to repel mosquitos, so place a few sprigs on the barbecue grill while you spend time outside, or hang bouquets of the herb on your porch during mosquito season. Sage features a sweet and savory flavor that perfectly complements rich and hearty dishes such as stew and steak. This silvery colored herb promotes healthy brain function, and it may even stave off Alzheimer’s disease. Surprisingly, sage goes quite well with chocolate, so try adding it to your dessert recipes. Butternut squash dishes tend to brighten up when combined with sage as well, especially when the two are roasted together. Your herbs should start to visibly thrive within just two or three weeks after getting them planted and settled in your mini kitchen garden. Happy planting! Thanks, Kelsey! I loves me some herbs! Oh, yesterday, I posted at Fatal Foodies about an impromptu tumbler plug Charlie came up with. A WRITING PROMPT FOR YOU: What does your main character grow in their kitchen garden? This entry was posted in Food. Tagged herbs. We’ve tried growing “green” stuff in our kitchen and the cats have destroyed or devoured it. How do you avoid that? Get a cat cage. Put the plant in it so the cat can’t get to it! If I wanted to grow something in a window, I’d have to cut a new window. Everything’s full up!